Well, yesterday I worked on the barge - its a boat built by S.P.A.T. volunteers working with the Cornell Cooperative Extension of Suffolk County. 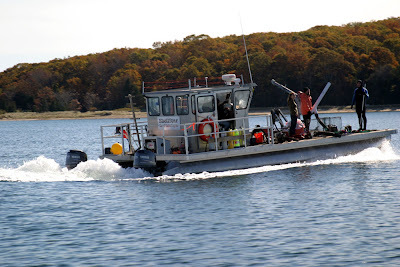 It is used mainly for the scallop restoration work, and is equipped with a motorized winch and a star wheel for hauling up lines weighed down by hundreds of lantern nets full of scallops. have very strong attachment points to the nets and to shells within the nets. Once the nets are cleaned and the scallops dumped onto deck, they need to be released to the bottom. 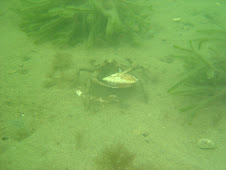 but it adds to the camoflage for the scallops on the bottom. The nets also often have lots of little guests in them, including hundreds of grass shrimp and mud crabs, spider crabs, cunner and tautog, and even sculpin. 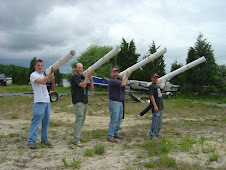 Sometimes we get pipefish and seahorses from the nets but this is more rare. 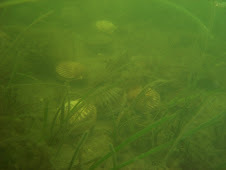 Additionally, some of this years seed (scallops from earlier spawns this year) have set on the nets and grown very well. All in all, it was a nice, messy day on the boat with some interesting things to see, including this awesome schooner, the Mary E, on our way home.